L.A. AREA EMMYS. 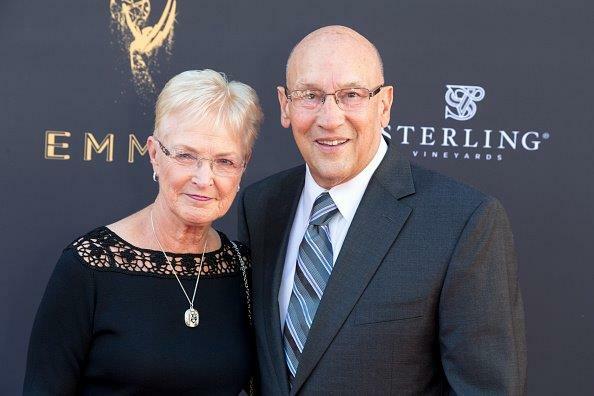 Bob Miller was presented with the Governors Award during the L.A. Area Emmys Saturday night. The full ceremony is embedded below; for the beginning of Luc Robitaille’s introduction, jump to 1:09:40 on the YouTube player. It’s followed by a nice tribute video put together by Jack Wilson of FOX Sports West that shares testimonials from Vin Scully, Jim Hill and Fred Roggin and segues to Bob’s introduction at 1:15:55. His Jack Kent Cooke impression and the telling of a famous Rich Marotta story follows exactly two minutes after. FOX Sports West, Prime Ticket and the Kings didn’t win any Emmys beyond the Governors Award in a year in which Kobe Bryant and Vin Scully-focused work cleaned up. Graphic designer Christopher Calleton of FOX Sports West/Prime Ticket was nominated, as were Prime Ticket videographers Jake Alba and Jake Loskutoff. LA Kings Production received a nomination for Black and White series premiere The Sutter Farm. Click here for more Emmy and Telly Awards notes. MAX POWER. The Daily News’ list of the 50 most powerful figures in Southern California sports is always an interesting read, one that signifies the changing of the season as it relates to Los Angeles and Orange County sports space. Gone from the list are Dean Lombardi, and Scully, for starters, and entering the list are NFL owners and Olympic and e-sports figures. Philip Anschutz clocks in at #7, Dan Beckerman isn’t far behind at #14, and Luc rounds out Kings representation at #35. For the Orange County edition, Henry Samueli enters at #16, and hey, we see you, #41, Randy Carlyle. There’s also a list of the 50 most powerful athletes, with Drew Doughty and Anze Kopitar checking in at 19th and 24th.